Have you been looking to get a top cop in your house? Just outfit your child with this Girl's Police Officer costume and you'll have a crime-stopper who's ready to work the beat. With badges and fun costume details, we're sure any public safety department will be looking to recruit her. If she takes the job, just make sure stops all of that crime before school! 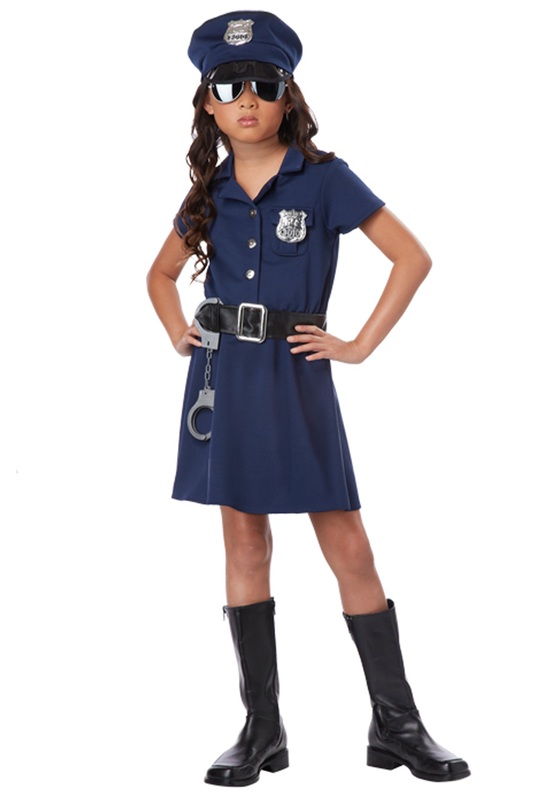 This girls police officer costume comes with everything she needs to be prepared for her first night on the job! The short sleeve shirtwaist dress has an elastic back waistband for a comfortable fit and it also has center-front buttons for added detail. The left pocket on the chest is functional and has a flap for a place to pin her badge. The black faux leather belt has a silver plastic buckle and the toy handcuffs can be hung from the belt. Don’t forget about the hat! The hat has faux patent leather bill and band and you can pin the second badge to the front of it.